The conspiracy theories that had been so instrumental in starting this march would reinstate the fury of the crowd, as many of the people started to believe the King would attack them soon. Lafayette would enter the building to talk to the King when he saw his men starting to position themselves for the upcoming attack. A group of women found an unguarded entrance to the palace and broke in to look for the queen. The Royal Guards tried to stop the crowd but they were quickly overpowered by the sheer size of the group that was attacking. The crowd would behead the Guardsmen and place their heads on pikes when they were caught, and historians often claim they may have killed the Queen had they found her. The Queen would barely escape before these ladies broke into her room, and tore the bed to shreds. Luckily, Lafayette would tip her off to what was coming and the two would escape towards the Kings room in a secret passageway. There were a few tense moments at the end of the tunnel where the opening to the Kings room was locked and they were forced to bang on the door to get someone to open it, since the King had gone to protect the kids. down, and his men would work with the Royal Guard to clear the palace. He eventually talked the King into addressing the crowd that was still gathered outside and promise them that he would go to Paris “for love of his subjects.” The crowd would cheer when Lafayette pinned a cockade to the hat of the Kings bodyguards. Things would get much more tense when the crowd asked to see the Queen though, with people pointing guns at her openly in the crowd. Again, Lafayette defused the situation by bending and kissing her hand, which ended the situation by a cheer of the crowd. Lafayette had saved the Royals with his status as a hero and his personal charisma, but this was largely theatrics and it ignored the underlying issues that people had with the monarchy. He would, over time, be increasingly seen as a person who wasn’t completely behind the Revolution, which would cause his popularity to slip ever so slightly. A crowd of over 60,000 people would accompany the Royal family back to Paris, singing songs and partying because they felt as if they had won. It was quite clear to everyone that the King had lost power at this point, especially when he realized they would basically become prisoners in the dilapidated Tuileries Palace. His only request upon entering was to ask for a book about Charles I of England, who was a monarch who had been deposed. 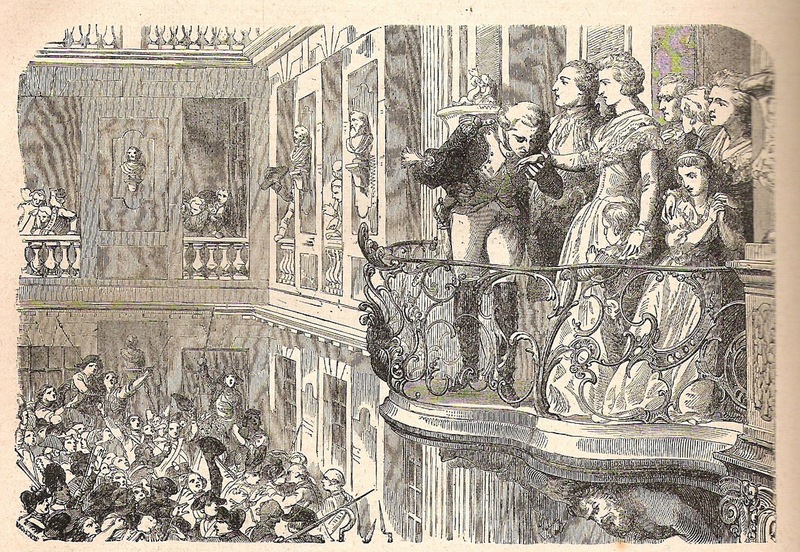 The majority of the National Assembly would come to Paris within the next 2 weeks, although some royalists left France in the fears of what the crowd would do next. A group would claim at this point that Louis Philippe II (Duke of Orléans) was trying to position himself to take over as King, since he next in line to be King as Louis XVI’s cousin. This was a very well informed conspiracy theory, since he often claimed he was more qualified to be King then Louis was, but it was still probably not true at this point. The King would have him investigated for this anyway, but wouldn’t be able to find any evidence of this.